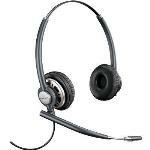 Plantronics EncorePro HW720 Expert Reviews - Read Reviews and Buy Smarter Online. Verdict: The HW720 works great with ShoreTEL and is a good looking headset. Worth paying a few more dollars if you are also looking at the HW520. No complaints. Verdict: Love it! Exactly what I was looking for!